Juan Carlos and Eusebio Royo Gabancho have been working in the fishing sector since 1989 buying fresh fish in Basque and Cantabrian ports. From the very beginning, our primary objective has been quality fish caught by our fishermen. In particular, Eusebio was on the Nuevo Erreñezubi, where he worked for several seasons fishing mackerel, Spanish white tuna and anchovies. Later, he worked on tuna fishing boats in the Pacific until he decided to join up with his brother and launch this quality fishing and preserves project. Year after year, our work has been recognised for the quality preserves and the traditional way we prepare them. This recognition has its reward, as our clients appreciate the overall taste we achieve with our anchovies based on their bouquet, aroma, colour, cleanliness and saltiness. OUR MOTTO IS “WE PRODUCE QUALITY, NOT QUANTITY”. It’s been more than 10 years since we began this project filled with enthusiasm. Our idea – based on solid principles – was to start creating our own little preserves company; and here we are, on the front line. The beginnings were hard; our activities were focused – contrary to what most were thinking of – on our commitment to quality and tradition and our devotion to the products caught by our fishermen; and here we are. My brother and I – along with our staff – are increasingly proud of the goals we have achieved and those that remain to be achieved, and of showing people that all it takes is good raw materials, a good team of people, and dedication to achieve everything one believes in. We believed it was possible to carve out niche in the market for our anchovies while still always making quality our number-one objective. As mentioned earlier, we buy products only from the Cantabrian Sea (BAY OF BISCAY) caught by the fleet of inshore fishing boats. Because the boats use traditional fishing methods, when fishing for anchovies they do not catch and discard other species. What’s more, the boats fish during the daytime, which means that the quality of the anchovies and other species caught is exceptional. As a result, the fish we buy at the fish markets is just hours old; it is transferred from the port to the salting process in our factory immediately. 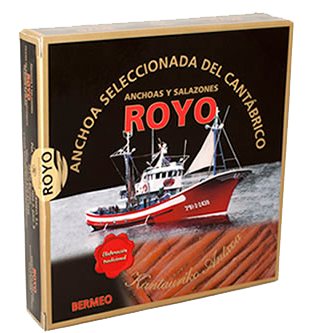 Related terms: Anchovies Royo, fish canning company of Bemeo, specialized in gourmet quality fish preserves. In Anchovies de Bermeo we made the elaboration of artisanal fish preserves from the Cantabrian Sea of Spain. In our online store we carry out the online sale of canned anchovies, anchovies, northern bonito, verdel, ... All our preserves are of delicatessen quality made by hand, achieving a product of the highest quality excellent for tasting. We ship to Spain always refrigerated, to ensure excellent preservation and quality. Discover our canned anchovies, anchovies and bonito from the north.